I don’t mind cleaning, decluttering, or even washing dishes. But doing laundry? Nope, not a fan. And although I have a laundry routine that I try to follow closely, there have been plenty of times when I’ve fallen behind. Like really behind. You know, the type that makes you wonder if you’ll ever make it out of the laundry abyss. Yeah, that bad. And since I’ve been there more times than I care to admit, today I want to share tips to help you get caught up if you find yourself in the same situation. Once you fall behind, you can’t continue to follow your normal routine and expect to get caught up. 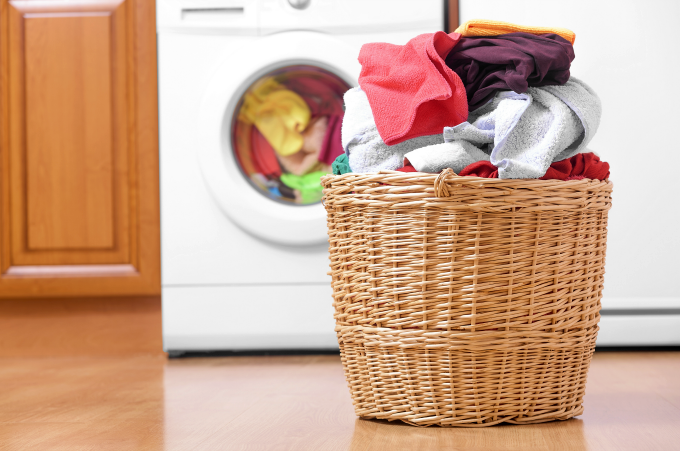 If you’re a little behind, you can probably add an extra load to your laundry routine and get back on track. However, if you’re several days behind, you’ll need to devote more time and focus on tackling your laundry piles. As much as I hate it, I go on a laundry spree until everything is washed, dried and folded. Yes, it’s time-consuming, but this method enables me to start fresh the following day. I’ve never done this, but I honestly have thought about it more than once. If you’re able to afford it, hire someone to get you caught up. This can be your local dry cleaners, a local cleaning agency or a mother’s helper. If you prefer to keep the money in the family, consider hiring one of your teens. I often think about the hours I spend on handling laundry and wonder if outsourcing this task would make more financial sense. I could easily free up several hours each week and be more productive in my business. I recently learned that Care.com has an option to find someone locally that can help with this. So yeah, I’m definitely considering it, and weighing my options right now. I’m a firm believer that everyone in the home should chip in, and that chores should be tackled through a collective effort. When I fall behind on laundry, I do all the washing, but when it comes to folding, everyone has to help. We’ll watch a movie on Netflix and tackle Mt. Laundry together. Before the movie is even halfway through, all of the laundry has been folded. Everyone takes their pile to their room, and mama is a happy camper. If all else fails, go to a laundromat. What else is better than access to several washers and dryers? I know this one can be tough if you have small children, but as long as you can keep them busy, going to the laundromat will enable you to tackle several loads at once. If you have one that offers free Wi-Fi, bring a tablet to help keep the little ones entertained. My preschooler doesn’t really watch TV, but she loves watching videos on the YouTube Kids app. Are your kids at school? Bring a book along, and enjoy some quiet time while your clothes wash and dry. Yes, this method costs a little more money, but as a temporary solution, it’s worth it. 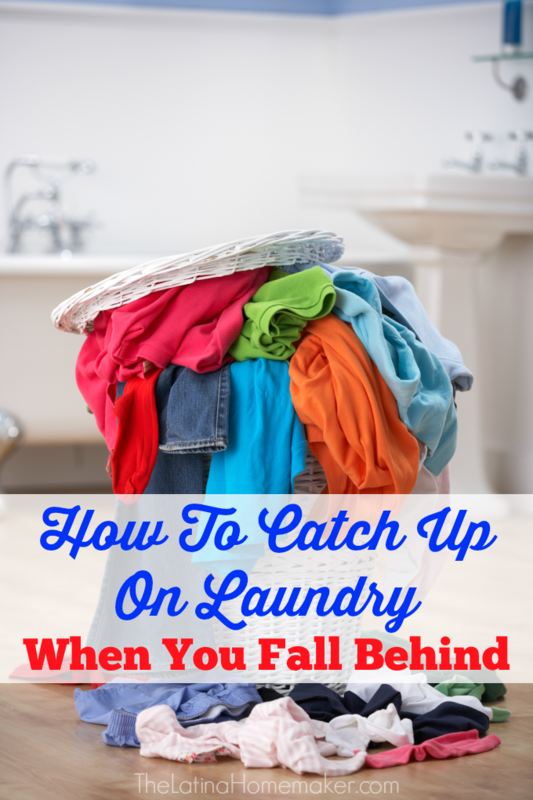 Do you ever fall behind on laundry tasks? How do you catch up? I’d love to hear your tips and tricks! Wait, you mean the answer is not to just buy new clothes? LOL. I am always behind, so I appreciate these tips. All hands on deck would have to be the way for me. I actually am behind on my laundry. We’ve been traveling so much these past few months that I’m backed up. Not so sure there is a laundromat close by but that’s a great idea too. Save my water bill.